Take the Kids Walking on the Mendip Hills this Half Term. Why not consider getting the outdoor clothing and sturdy footwear ready to explore the wonders of the Mendip Hills? There are so many public footpaths and bridleways dotted across the hills, you’re bound to be able to find a walk that will suit even the youngest of adventurers, so why not start planning now? For the more adventurous, why not consider taking one of the routes up the steep slopes that fringe Cheddar Gorge. These paths, particularly at this time of year, are likely to be quite challenging for those who are not seasoned walkers, especially as the paths are likely to be wet underfoot and therefore requiring added caution. As such they may prove too much of a challenge for the younger members of your party, so this is definitely one for the slightly older children. However, for those adventurous enough the take on the challenge, the views of the Gorge, Cheddar, the reservoir, Axbridge and the surrounding countryside from the unique position offered from the tops of the rocks are awe inspiring. They are sure to be worth the effort but remember to stay well back from the edges as the drops are steep and long. For those looking for a longer walk once you have reached the top of the Southern side of the Gorge, there are paths signed to Draycott, a village on the main road between Cheddar and Wells. Don’t forget though, if you have left the car in Cheddar, you’ll either need to walk back or you could catch the bus that runs between Wells and Weston-Super-Mare which stops in Cheddar. Picture 1 shows the view down Cheddar Gorge. If the Gorge walk appears too daunting, why not consider heading for the highest point of the Mendips, this being Beacon Batch on Black Down. There are a number of ways up onto Black Down but after the initial moderate climb, the final ascent to Beacon Batch itself is relatively gentle so even the youngest of walkers will find this offers little by way of effort. If you are lucky enough to make the ascent on a clear day, which could be possible even in February, then the rewards on offer by way of the views will not leave you disappointed. 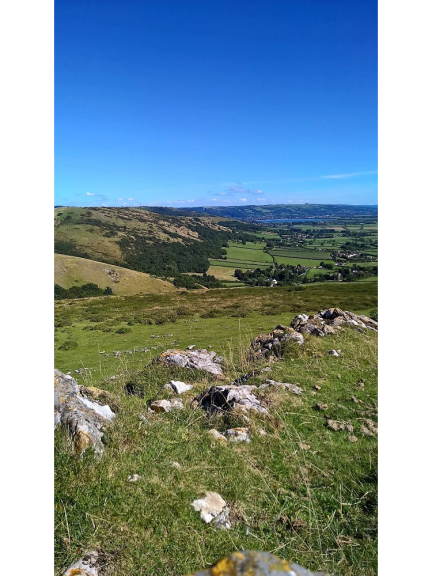 From the summit, views of the lakes in the Chew Valley are to the North East and you may even be able to watch planes taking off and landing at Bristol Airport, also to the North (this one is quite a way off so if you have binoculars it would be wise to take them with you). Views to the North / North West also include the Bristol Channel, with this leading down towards the seaside towns of North Somerset and the South Wales coast on the opposite side in the distance. To the South you may be able to pick out the tops of the hills that are cut through by Cheddar Gorge and to the West, the series of hills leading eventually to Crook Peak. If history is of interest to you and your party, then there are several Bronze Age burial mounds dotted around the hill top, along with rows of small mounds created in World War 2 to prevent enemy aircraft from landing. There are signs by the former asking visitors not to climb them so please keep an eye on children here. They may however be distracted already, as quite often there are ponies wandering freely on this hill top. Picture 2 shows ponies on Black Down. For a third option this half term, why not head to the rocky peak visible to all traffic thundering up and down the M5, this being Crook Peak. Whilst this is almost 150 metres lower than Beacon Batch, because it sits at the end of a chain of hills that rise from the vast flat lands in this part of Somerset, it looks more impressive. Again, there are many and varied paths available to reach the top but my favourite route to the rocky outcrop starts in the car park to be found on Winscombe Hill. This can be reached by taking the turning on the left when travelling North on the A38, just before the Texaco garage at the top of Shute Shelve Hill. From the car park, the path takes you through King’s Wood, across Cross Plain, onto Wavering Down, across Compton Hill and then up to Crook Peak itself. This is a relatively long walk across undulating hill tops and again, like on Black Down, don’t be surprised if you come across ponies on these hills. On occasion, there are also cattle grazing along this route, so dogs should be kept on leads if you have them with you. If the weather is clear, the views all around will take your breath away. My favourite view from atop this peak is towards the South East, past Nyland Hill, onto the legendary Glastonbury Tor. This often makes me wonder at the powers that have in the past created the astonishing landscape that I and my fellow residents of Mendip are so lucky to live in. Picture 3 shows Crook Peak in the distance from Wavering Down. Hopefully this will give you a few ideas of how to keep the kids occupied. One thing is for sure, any one of the walks should use up some of the limitless energy most kids have, so that in itself must be worth it.